Summer is a great time to enjoy fresh fruits and vegetables! My husband planted me a very small garden as a Mother’s Day Gift this year and although we haven’t been able to enjoy eating our own crop yet, we’re excited to have begun to learn the process of growing a garden. Cindy has been a huge inspiration. She has an awesome garden! Have you taken a walk through her garden yet? As the season has progressed, Cindy’s garden has become more and more impressive! 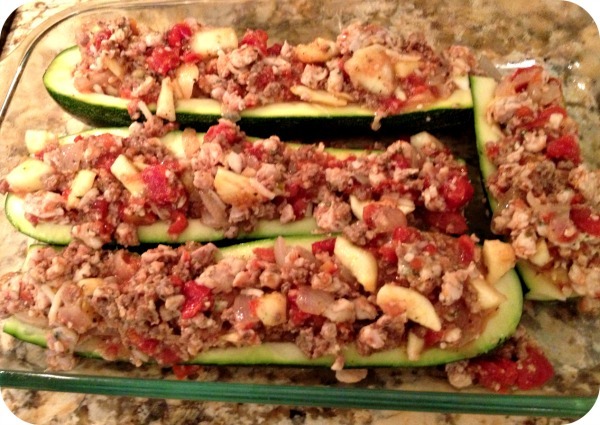 I was so motivated to make this delicious Stuffed Zucchini Boat Recipe my friend shared with me recently. I saw her making it one night but didn’t stay for dinner to try it. I drooled over how good they looked so much that she texted me the recipe. I finally gave it a try this week and they were just so delicious! They made for a hearty, filling, and guilt-free dinner that our whole family enjoyed. You’ll definitely want to give this recipe a try! Pre-heat oven to 350 degrees. Spray 13×9 Pyrex Pan with cooking spray. Add olive oli, minced garlic, onion and ground meats to pan and cook until brown, about 6-8 minutes. While the meat is browning, slice zucchini lengthwise and scoop out pulp. 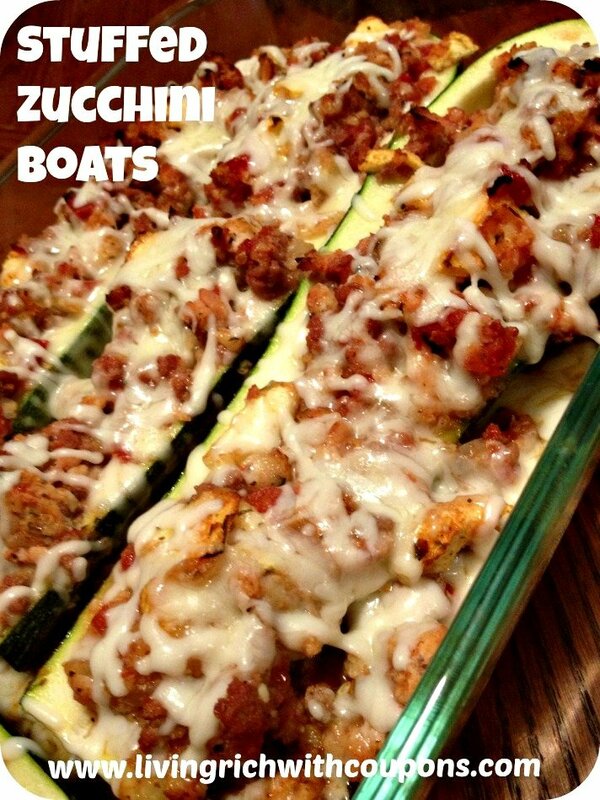 Set pulp aside and place zucchini boats in your baking pan. Chop your zucchini pulp into bite size pieces. When meats are done browning, pour this mixture into a large mixing bowl and add the chopped zucchini pulp. Add diced tomatoes, seasonings, bread crumbs, parmesean and 1/2 cup of the mozzerella cheese and mix well. Scoop a generous amount of this mixture into each zucchini boat. Bake for 35-45 minutes, adding remaining mozzerella to the top of the zucchini for the last 5 minutes.